Dimensional Self-adhesive Chipboard. Add some fun dimension to your next paper crafting project. 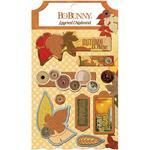 This package contains stickers in various sizes from Bo Bunny.